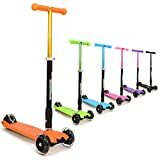 A wide range of scooters that is leaving a real imprint on the image of urban mobility in the world, an unmatched design and quality level on the market. Sized-down mini micro in Deluxe version, extremely durable, extends from 44 cm to 64 cm to adapt to children as they grow, non-slip footrest with embossed logo. Innovative steering system: with a simple tilt of the body it allows the child to curve and learn balance while playing. Easy and incredibly safe rear brake. 2 to 5 years, Maximum load: 35 kg. Micro Mini Deluxe with anodised colours. Telescopic handlebar, heights from 48 to 64 cm. Maximum load capacity of 35 kg; suitable for children from 3 years of age. 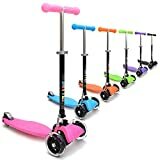 Our Top-Selling 3Style Scooters RGS-1 Kids Three Wheel Kick Scooter for little kids aged 3 - 6 years old. 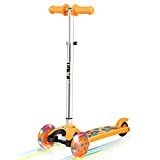 Easyglide tilt- to-turn joystick steering system, ideal for building confidence in the youngest of scooter fans! Complete with three of our signature Spin & Flash PU LED wheels add a splash of colour to every scoot. 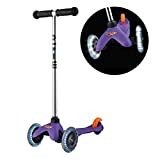 The scooter is height adjustable from 52 cm to 78 cm to suit the height of the rider. The lightweight and foldable composition make the three wheeled scooter easy to carry and convenient to store when not in use. The streamlined new deck design adds stability and super strong steel handlebars ensure the smoothest of rides, even making rough ground a breeze in the park. 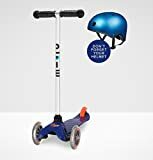 This awesome scooter is specially designed and exclusively manufactured for 3style Scooters and available in Blue, Pink, Green, Orange, Purple and Black. 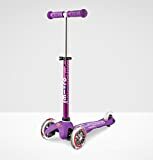 The Award Winning, Swiss Designed And Engineered Scooter Is Now Available For Even The Youngest Member Of The Family. Stage 1. A Ride On Scooter For 1 To 2 Year Olds. Stage 2. 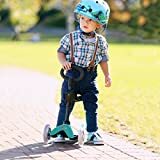 A Toddler Scooter For 2 To 3 Year Olds. Stage 3. 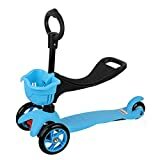 A Mini Micro Scooter For 3 To 5 Year Olds. 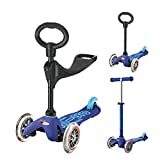 One Scooter With 3 Different Stages To Grow As Your Child Does. Lightweight allowing children to use it with ease. Superior Swiss engineering making the scooter robust and long lasting. 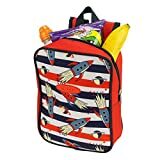 Suitable for children aged 3-5 years. A Ride-On, A Toddler Scooter And An Iconic Mini Micro All In One. Iconic Swiss Design And Award Winning Engineering. The mini micro deluxe version has a 44-64cm adjustable handlebar and can carry children weighing up to 35 kg. The Platform, brake and the handlebars are in different shades of the same colour. The anodised t-bar gives your scooter a unique look and an unmatched resistance to wear and tear. 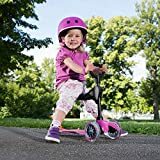 The scooter is very stable thanks to two front wheels and with the easy and effective brake, your child turn safely. Unique Deck With Raised Silicone Micro Grip.